Weekend EXCLUSIVE. Samsung Galaxy S4 Zoom product photo showed up! As you might know Samsung going is to show new products on June 20th in London. One of these products will be the Galaxy S4 Zoom. SamMobile received the first photo this Wednesday and today we will give you the first picture. The Galaxy S4 Zoom uses a 4.3” qHD sAMOLED display a 1.6GHz dual-core processor, 16 megapixel camera sensor with optical zoom, 8 GB intern with extern micro SD up to 64 GB, Bleutooth 4.0 LE Wi-Fi 802.11 a/b/g/n, and A-GPS. You are able to call with the Galaxy S4 Zoom, Samsung added a shutter button to the the device and the volume rockers or zoom buttons are on the right side. The Galaxy S4 Zoom runs on Samsung’s own Touch-Wiz Nature UX interface with Android 4.2.2 Jelly Bean on it. 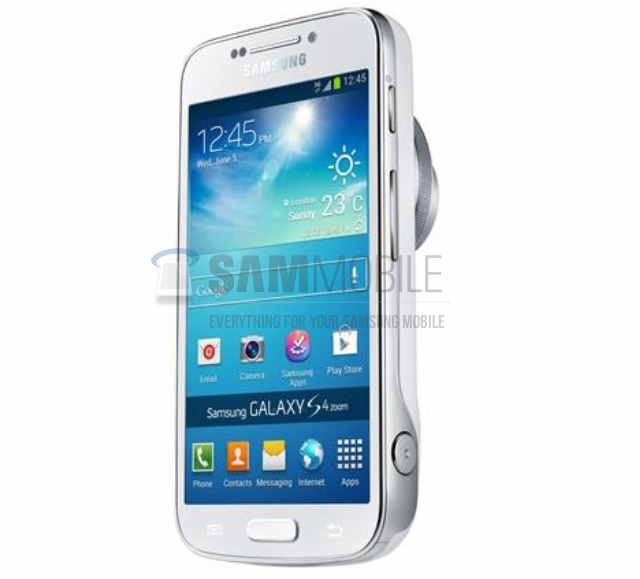 The Galaxy S4 Zoom will be Samsung last product of the Galaxy S4 range. Samsung already has the Galaxy S4, Galaxy S4 Active and Galaxy S4 mini. As you might notice the Galaxy S4 Zoom looks a lot like the Galaxy S4 mini. The Galaxy S4 Zoom is Samsung’s first cameraphone based on Android. Where’s the 4.2 Jellybean update for Galaxy S3? Very nice, might be a bit too thick though. But come on Samsung 8gb is pathetic that will leave only 4 to 5gb for us & that will be used up in no time with non movable apps. Nokia camera monster phones seem better if only they had android. Well, it looks an amazing device to me. Something is wrong with the button placement. Precisely: the volume keys should be switched with the power key. The power key should be either in the middle of that side – or be the other side. Of course, if that is the real product. Also the lens at the back… I don’t know what to think about it, but I’m not thrilled. hey sammobile is this 100% the zoom for sure or are you Jsut trusting your source? So when I’m talking on the phone, I’ve got a lens sticking into the palm of my hand?